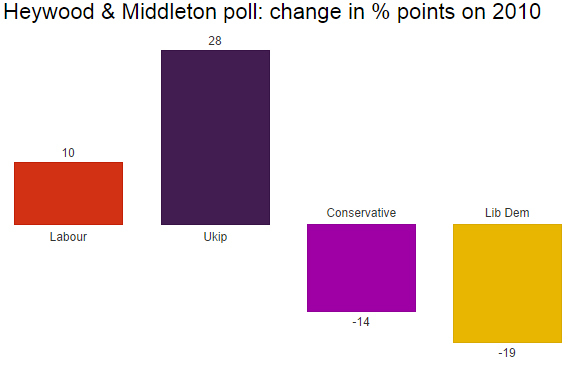 Both Labour and Ukip seem to be profiting from a fall in support for the Tories and Lib Dems. The latter in particular look to be heading for yet another wretched by-election performance. 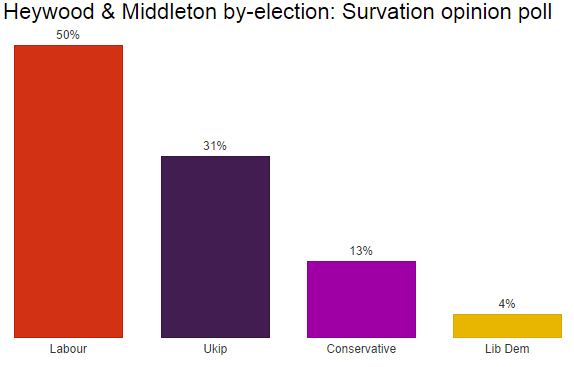 Damian Lyons Lowe, chief executive of Survation, notes that the poll shows Ukip taking 45% of Tory 2010 voters and 19% of Labour 2010 voters. I don’t think the outcome of this contest was ever really in doubt, though Ukip has done its best to scare its rivals into thinking it might win – and they have responded in kind, Labour especially. The margin of Labour’s victory suggested by Survation’s poll is in line with how the party has fared against Ukip in recent by-elections. If anything a 19-point gap is on the low side. In the Wythenshawe & Sale East by-election in February 2014, Labour won with a 37.4-point lead over Ukip; in South Shields in May 2013 it was 26.3; in Rotherham in November 2012 it was 24.8. It’s the percentages that will be the most interesting thing to watch for next Thursday. The winner, both here and in Clacton, is a foregone conclusion. Interesting colours: magenta for the Conservatives? It looks blue to me! But then I am slightly colour-blind. Um, that is not blue! Scotland voted No to independence – but might it vote Yes to the SNP at the election?